This page is about social networking and the various tools that social sites provide for users to interact, such as chat, messaging, email, video, voice chat, file sharing, blogging, curating, social bookmarking, and discussion groups. Social network sites are websites that use social media to allow a user to create a public self-profile and also maintain a list of other users in their social network. The user can usually view the profiles and social networks of others within the system. The sites usually provide several ways for users to interact, such as chat, messaging, email, video, voice chat, file sharing, blogging, and discussion groups. After joining a social network site, the user is asked to answer a series of personal questions. The user’s online profile is generated from these answers which typically include descriptors such as age, location, interests, and an “about me” section. Most sites also encourage users to upload a profile photo. Some sites allow users to enhance their profiles by adding multimedia content or modifying their profile’s look and feel. The visibility of a profile varies by site and according to user discretion, privacy of information is a hot issue at present in the social network arena. Users are prompted to identify others in the system with whom they have a relationship. Wikipedia provides a list of over 200 social network websites, with Facebook being the mostly widely used in 2011, (see infographic below). Many networking sites seem to focus on a specific target audience based on location, nationality, ethnicity, or interests. Some social network sites, e.g., LinkedIn, are specifically aimed at professionals. Social bookmarking has the power to change the way you look for material on the web. In a personal bookmarking system such as the one found in most browsers, users store links to web pages that they find useful. In a social bookmarking system these lists can be made accessible by the owner to other users of that bookmarking system. 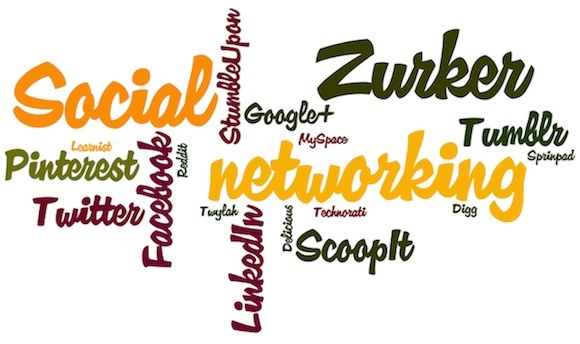 The users categorize each online social bookmark by the use of informally assigned, user-defined keywords or tags. Other users with similar interests can view the links in the system by topic, category, or tags. The results of these searches are usually more useful to the user than those conducted using traditional search engines on the web. So in social bookmarking sharing the tagging information assists in research by others. StumbleUpon, Technorati, Digg, Tumblr, and Delicious are examples of social bookmarking sites. There are now some very attractive variants on the social bookmarking theme that come under the description of “curating“. These are tools that enable users to create lists of resources on particular themes and then publish them on the Internet. Paper.li enables you to curate your content in the form of online newspapers, whereas Scoop.it does it in the form of story-boards, and one increasingly popular curating system (Pinterest) enables the creation of pin boards (as shown in the picture here).